Have you ever opened that drawer or cupboard where you keep your mismatched collection of bottles, sippy cups, teats, old lids and various other bits of plastic you’ve acquired over the years and wished you could just chuck the lot of it and start over? I know I have. What’s more, if you have a toddler who likes to open drawers and deposit their contents throughout the house, you’re probably missing vital components of all your feeding systems – and nothing causes stress like a screaming child when you just can’t find the lid for that cup. There’s an even more compelling reason to consider replacing some of the plasticware in your home – the evidence of the negative effects on your family’s health from BPA toxins in many plastic bottles and cups. Exposure to and consumption of BPA has been linked to cancers and many other developmental and health problems. Not only are the effects of BPA toxins more extreme on children, but recent studies have found that the process of heating plastics (for example, through sterilization) allows the BPA toxins to leach out up to fifty-five times more rapidly! 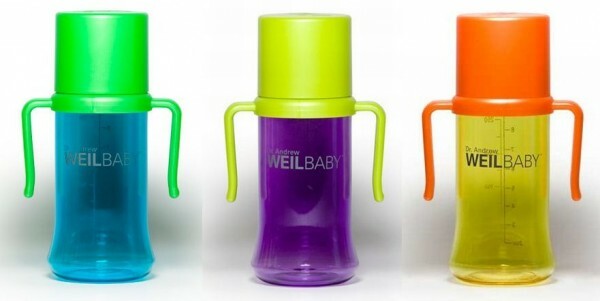 All this adds up to a need for bottles and cups for our kids which are BPA-free and now you can get a whole range through the US-based WeilBaby system. It’s arriving in Australia for the first time on 20 May. You can buy bottles and cups individually or in handy starter packs for different ages and stages. Not only are the bottles BPA-free, they are heat and shatter-resistant, dishwasher safe and they look great too. There are a huge range available at Metro Mum and prices for individual cups start at $17.95. Various gift and starter packs (four bottles plus teats and accessories) are also available, beginning from $109.95.